The bird was apparently only put on the Rare Bird Alert because it was believed that it had moved on and was therefore out of danger from greedy falconers. So, of course, the bird was refound on Saturday and viewed sitting on an Osprey platform from Gilgo Beach. I heard about the resighting second-hand and raced out to Gilgo Beach only to find out upon my arrival that what was apparently the bird was sitting all the way across the bay on a small tree. The fog and rain and distance made seeing much at all difficult, though it was obvious that the bird was a large falcon and it looked pretty bulky. In the hour-and-twenty minutes I watched the bird through my scope it didn’t do much. The only action was when it looked like it pooped and then it flapped its wings twice. Those wings looked huge and broad at the base. Because my trip to Gilgo was unplanned and spontaneous I hadn’t worn clothes that were appropriate for the rain and was completely soaked through, cold, and aware that Daisy wasn’t happy that I had left her home doing laundry and watching Desi, our three-year-old. 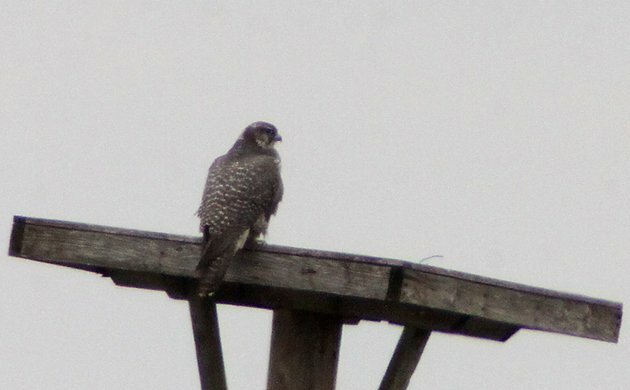 So I packed it in, feeling 98% sure that the bird I saw was the Gyrfalcon, but not happy with the looks that I got. On my way home I got text messages from the birders still there that they had managed to confirm the identification. Yay, I guess? I needed better looks! Overnight, as word leaked out on to various listservs and Facebook pages, it became clear that a pretty big chunk of the New York birding scene was going to be at Gilgo Beach today. I got out there at about 11 AM with Desi in tow. There were lots of birders there and, more importantly, viewing conditions were much more favorable. We enjoyed our time watching the falcon, particularly when it took a long flight across the bay to the Osprey platform on which it had been viewed perching on Saturday. Finally, the looks I wanted at this extremely impressive Gyrfalcon, my first. Word is now pretty much out on this bird so if you want to go, get yourself to Gilgo Beach, which is on the north side of Ocean Parkway between Tobay and Oak Beach. Park in the lot and scan the marsh, the Osprey platforms, and everything else you can see. Odds are there will be other birders looking for the bird as well. First, congrats on lifer Gyr. Second, someone caught (illegally, Im sure) a vagrant Gyr? Then released it? Whats the story there? Wow. That was quite the post. Damn, I’m sad I couldn’t see this bird. 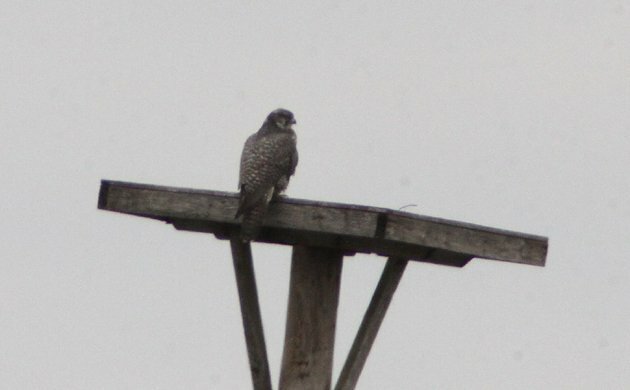 I don’t know if this site is still active, but yesterday, 9/20/2015, I saw an almost completely white gyrfalcon. It was at the very top of an almost barren pine type tree. It took my breath away. I looked it up right away and clearly that’s what this huge bird was. I am in Massapequa, NY which is right next to Suffolk County where one was confirmed. I’m not a birder so I wasn’t sure whom to tell. By the way, my neighbor saw it with me so I have confirmation. I certainly hope you have a picture because a Gyrfalcon in September would be quite a sighting! May have sighted a Gyr Falcon in Aventura, FL. Far south of his usual range?! Trying to confirm. Very unlikely. Do you have pictures or a written description?